Hoorah! 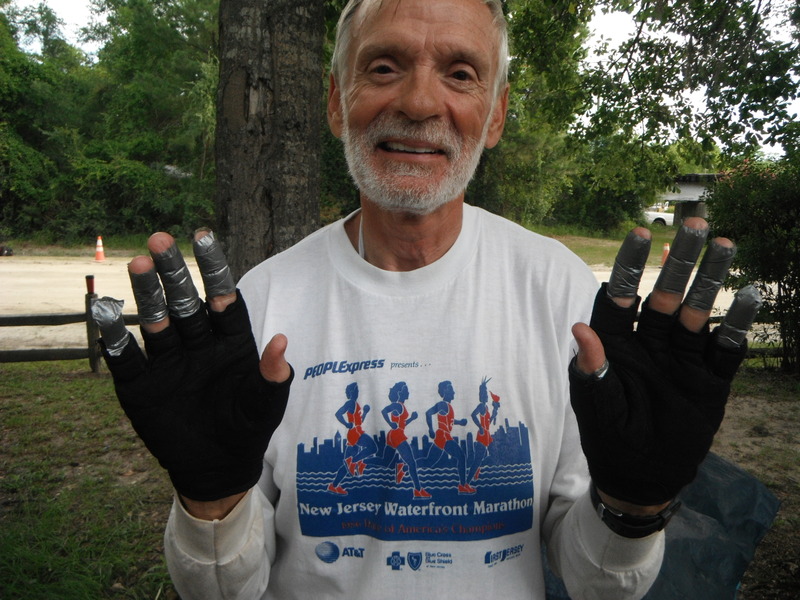 Judge John R. Turner sides with Ogeechee Riverkeeper and sent the case back to the administrative law judge! Read details below. Chance to win $50,000 Water Trails video production – VOTE for us!! Only 11 more days left to VOTE for us! 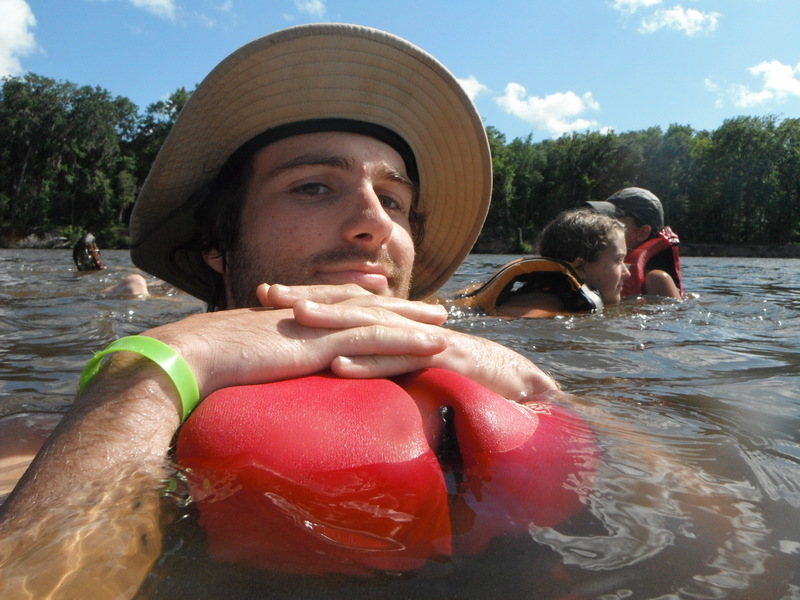 We reeeeally want to work hard at promoting WATER TRAILS this year. Help us out by casting your vote TODAY. If we win, we get a $50,000 Water Trails video produced by film making company, Encyclomedia!! Purchase some of these beautiful Paddle Georgia pics taken by Rena Johnson and %10 of proceeds goes to GRN! Check out these beautiful Paddle Georgia pics taken by Rena Johnson and available for purchase ~ %10 of proceeds goes to GRN….. yeaaah! 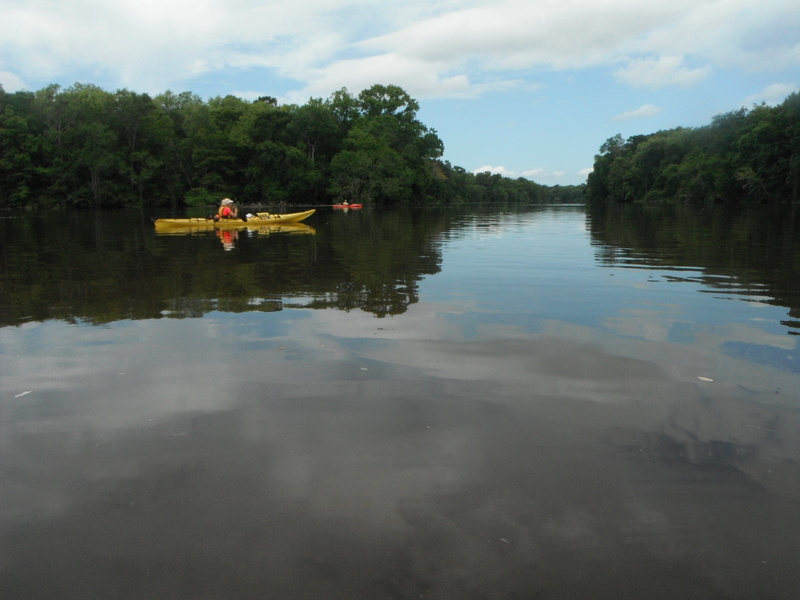 Paddlers line up in “Rifle Cut,” a narrow man-made channel connecting the Altamaha and Darien rivers. 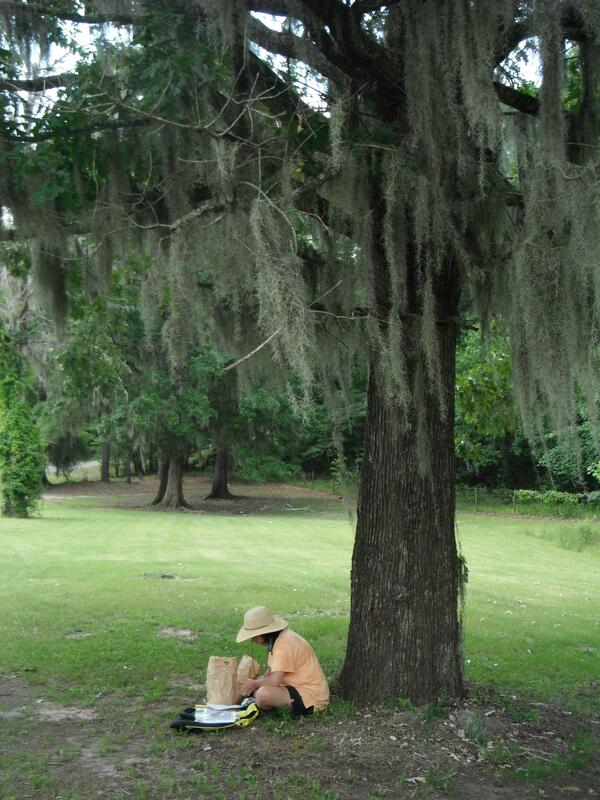 As I write, the high in Rome is 105…I am ready to return to the cooler confines of the Altamaha. For all of Paddle Georgia’s highlights, the lead story was the weather—not a day above 90, evening lows in the 60s and not a drop of rain—for seven days. This doesn’t happen often in South Georgia in June. The weather was so mild there were times when I emerged from a submersion in the Altamaha to shiver in a cooling wind…but that’s enough talk about the weather, we have more to discuss. Hospitality—The people of Appling, Tattnall, Wayne, Glynn and McIntosh counties rolled out the red carpet for us. The folks in Tattnall County arranged tours of their wine country (who’d-a-thunk-it in the Vidalia Onion belt? 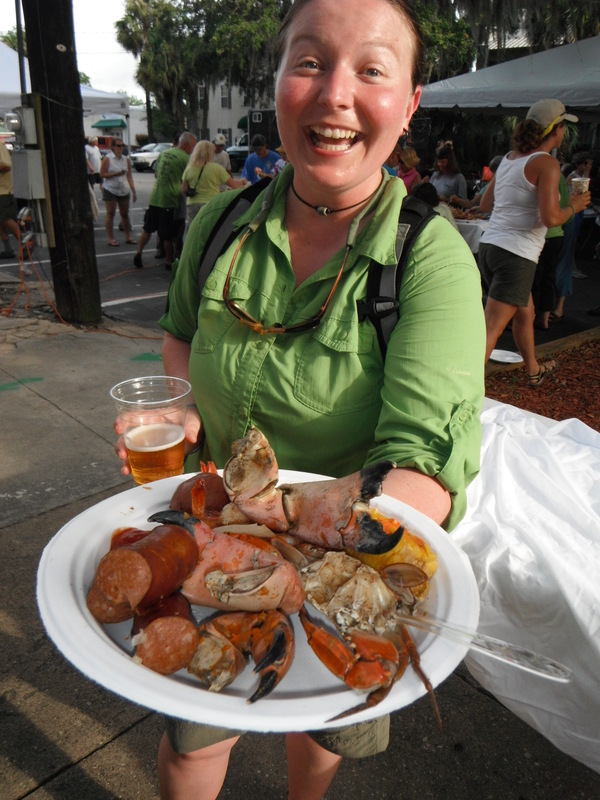 ), Appling’s best greeted us at Morris Landing with ice cold water and cookies, Wayne’s Visitor’s Bureau went the extra mile…water slides, pools, countless tours, shuttle buses, cold drinks and more; and finally Darien and Altamaha Riverkeeper pulled out all the stops, shutting down a city street for our block party, featuring a low country boil and live music. 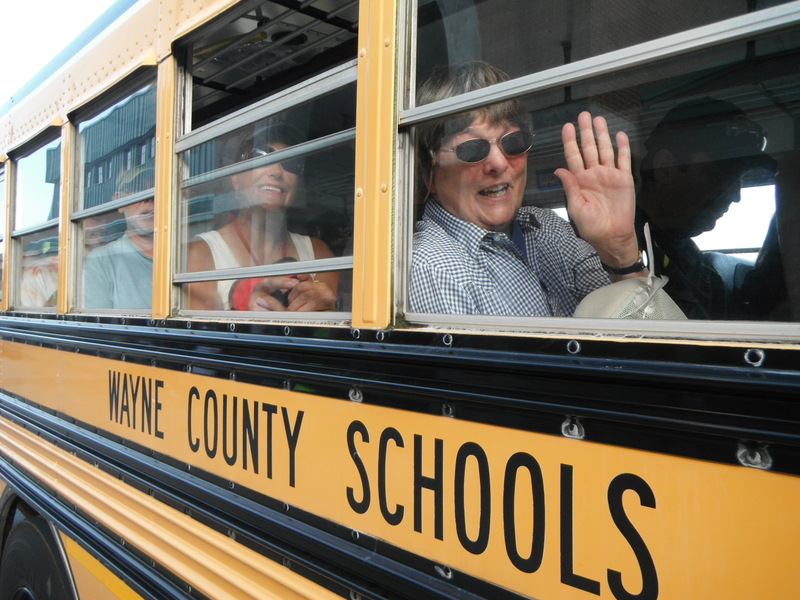 Dee Stone loads up on a Wayne County School Systems bus for the ride to another launch site. Yes, I know, Paddle Georgia has an economic impact on communities; they are happy to have us. We fill up hotels and, it appears, any place that serves margaritas. In fact, Wayne County reported to us that the event pumped $100,000 into the local economy each day of our stay. Business is business. Still, it is nice to live in a state where genuine hospitality motivates the convention and visitor business. 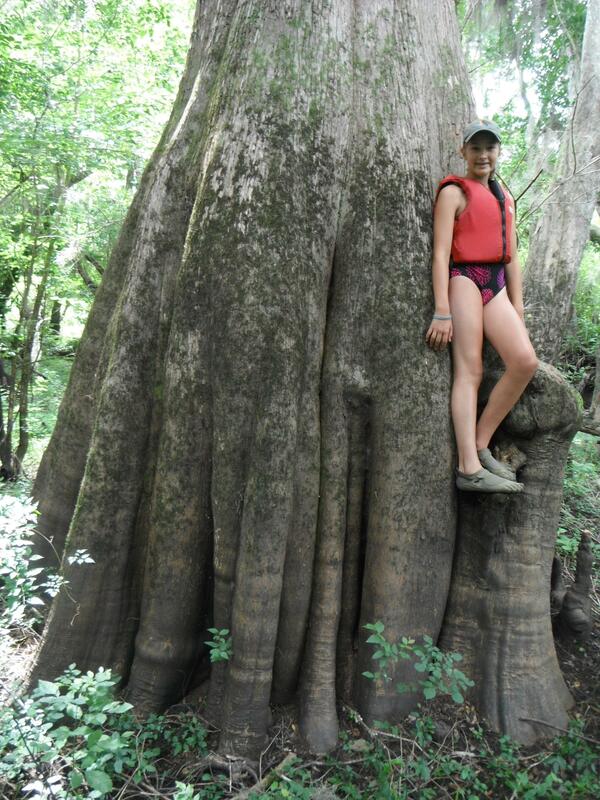 A massive cypress dwarfs Ramsey Cook at Miller Lake. Primeval—There are but a handful of places left in Georgia where this adjective works. We found a few this year. Day 6 brought us to Miller Lake, a slough noted as the home of Georgia’s record bald cypress tree—a mammoth, primeval monster that measures 43 feet 5 inches in circumference. We didn’t find this champion, but its old relatives were all about. 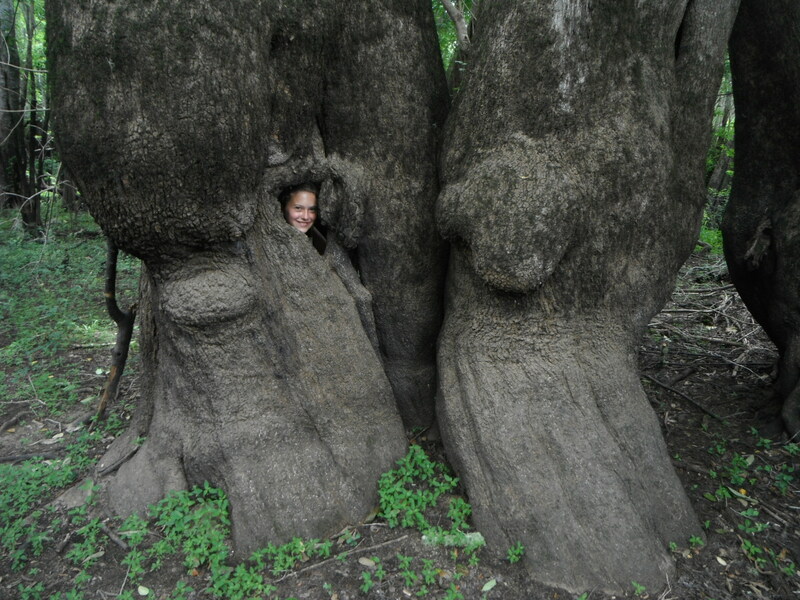 They sported cavities large enough to house several adults…12-foot-tall knees…wild, winged buttresses. A place like this instills a sense of wonder. I felt small, like a kid again, like there was still so much of this big beautiful world I’ve yet to see. Then the mosquitoes attacked…and we paddled on. Cobb Creek, a blackwater tributary of the Altamaha in Toombs County. 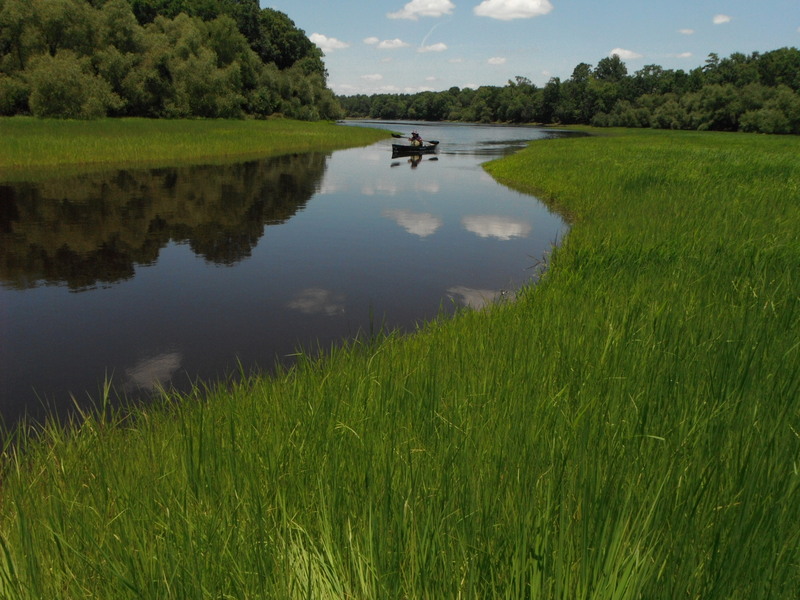 Blackwater—In late May when we decided to move the trip from the Ohoopee River to a full seven days on the Altamaha, the Ohoopee was running at 20 cubic feet per second (cfs)—just enough to float a paper boat. On the first day of Paddle Georgia as we launched from Deen’s Landing on the Altamaha, the Ohoopee was flowing at 300 cfs, more than enough to float our armada. I regret that we did not get the full experience of the Ohoopee, but our excursions up the Ohoopee and other blackwater tributaries gave glimpses of the beauty of these tannin-stained waters…and one day, we will return to enjoy their charms. Paddling past the Rayonier pulp mill in Jesup. 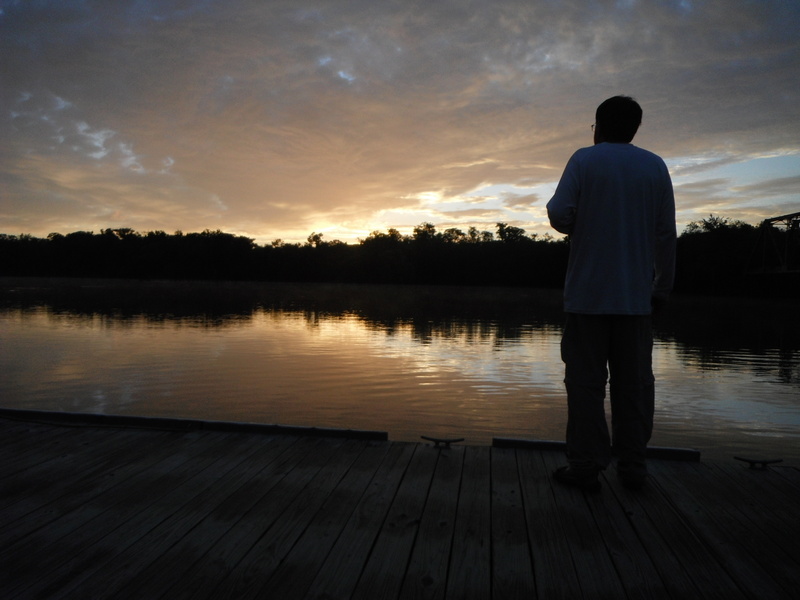 Rayonier—When April and I scouted the Altamaha in August 2011, our experience was profound. We spent a glorious day, fully seduced by the Altamaha’s charms. Late in the afternoon after a break at Jaycees Landing for a cold drink on the bait shop’s front porch, we headed down river toward Rayonier. Almost immediately we were confronted by the smell. And it got worse. April tied her bandana around her nose and mouth because the smell was so strong we could taste it. Below the discharge, the entire river became an inky black color and there was pulpy stuff suspended in the water. The smell emanated from the water and remained with us for about 20 miles downstream. We immediately began wondering how we would deal with this during Paddle Georgia. First, there were basic questions of safety. This would be a 22 mile day and people would be reluctant to swim – an important antidote for heat-related problems. We also expected that many of the paddlers would be upset, angry and perhaps even sickened by the discharge. 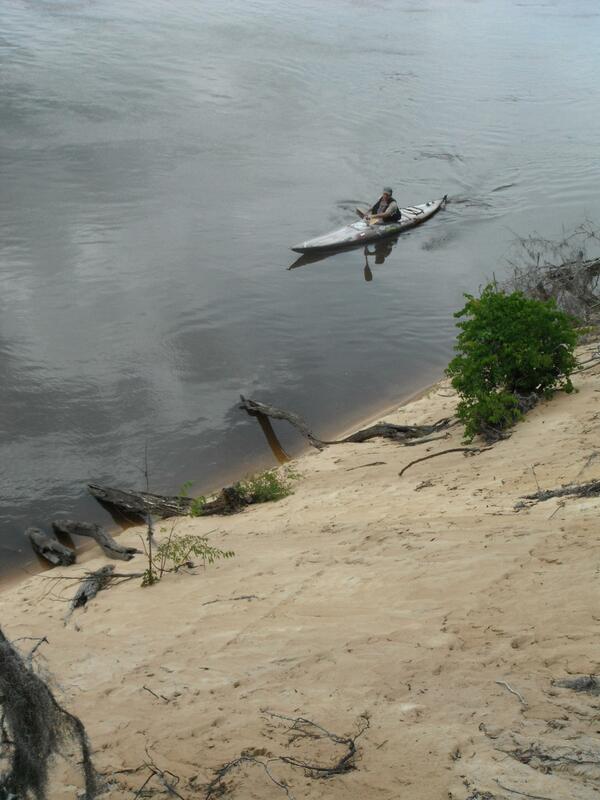 A kayaker drifts beneath one of the Altamaha’s bluffs. 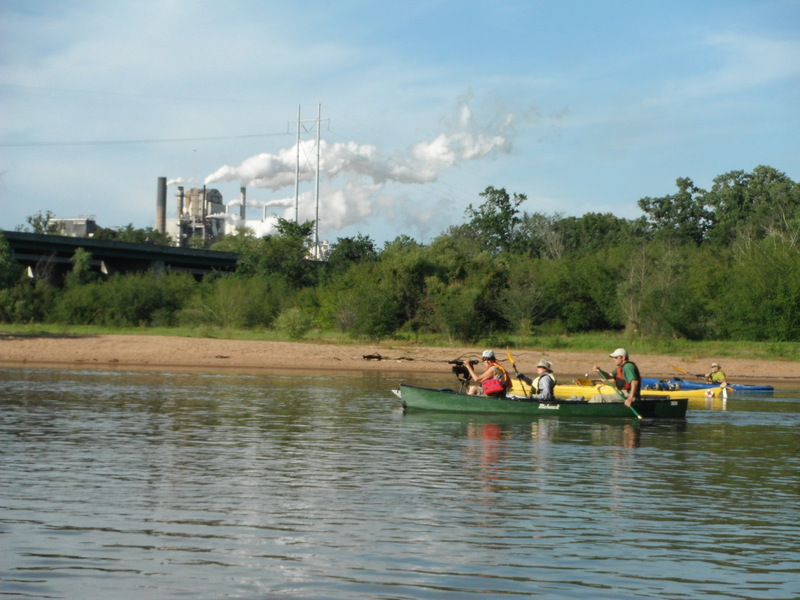 Though we have traveled more than 700 miles of Georgia rivers, we had never taken our participants by a pollution problem as egregious as this. Given the seriousness of this problem, how would we handle the reactions and what opportunities would we give participants to understand and take action against this affront to the Altamaha? In the end we did what we have done in the past: we invited the local Riverkeeper to present on this issue, we encouraged the media to report on our journey, and we provided paddlers with the opportunities to take action to address the problem. What transpired during the trip was instructive. On the day preceding our passage by Rayonier, the unpleasant fumes from the plant wafted up river. Many paddlers became nauseous. One had an asthmatic reaction and could not paddle for the next two days. Outraged by what they had learned from the Riverkeeper, offended by the smell and fearing the worst the following day, some paddlers were ready to carry signs on the river and confront Rayonier, demanding action to clean up the mess. An equal number of paddlers considered such action offensive, especially given the hospitality provided by the Tourism Board—funded largely by Rayonier. The diversity of opinion was intense—some defending the facility for the jobs they provide; others blasting the multi-national corporation for its million dollar profits at the expense of the Altamaha. 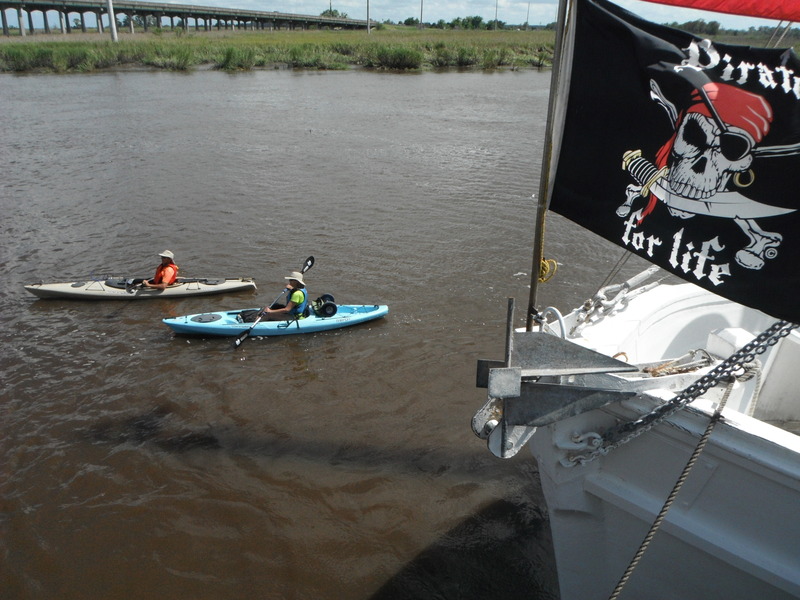 The following day, we paddled past the discharge. It stained the water and imbued the river with that distinct pulp mill stench. Paddle up a slough off river and the smell subsided; venture back into the river’s flow and the smell slapped you again. The two 13-year-old paddlers in my boat didn’t raise their water canons on this day. There were no water battles. We swam, but only far downstream and with little enthusiasm. The river simply wasn’t the same inviting place it was the previous day. Why the discharge was so different than it was on our scouting trips, (or experienced by the Altamaha Riverkeeper and other recent river users) , is anyone’s guess. Rayonier’s plant manager, Jack Perrett, told WSAV in Savannah that the plant was operating as normal. Click here to view video coverage from WSAV. 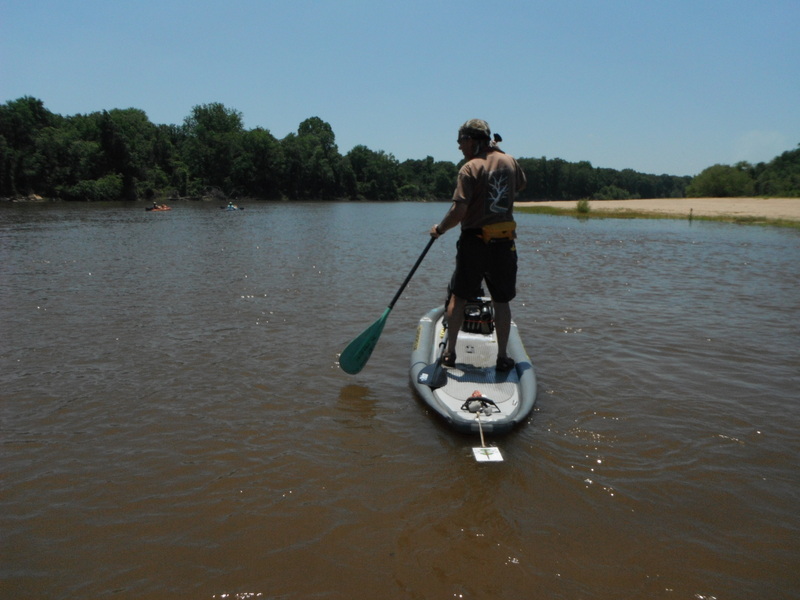 Tom Sewell became the first Paddle Georgia participant to complete a “thru-paddle” on a paddleboard. I suppose our previous trip occurred on an “abnormal” day. On the other hand, perhaps the facility is making strides, as its operators claim. Either way, the clean up of this discharge is a long, long way from meeting the requirements of the Clean Water Act. That 40 years of environmental regulation has not fixed this problem is an indictment of corporate neglect and the failure of state and federal environmental agencies. When a child is afraid to load and fire a water canon, there’s trouble in river city. For all the hospitality that was shown Paddle Georgia in Wayne County, the best welcome—and the best homecoming for those who work, live and play there–would be a clean river. Click to visit the Altamaha Riverkeeper website to view a documentary of the discharge’s impacts. 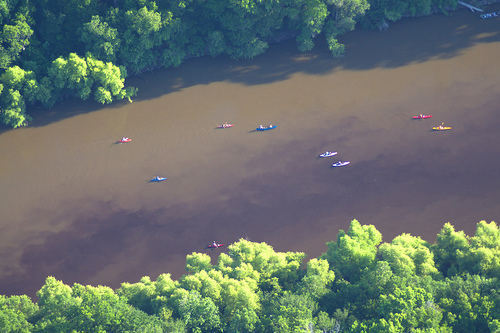 Click here to see an aerial view of Paddle Georgia participants paddling through the Rayonier discharge. Paddlers stroke along the waterfront in Darien at the journey’s end. Mighty Movements—This was the first time that our journey has ended at a river’s ultimate destination—the sea. Paddling into Darien, we had at our backs the collected flow of one quarter of Georgia’s land—a trickle from a gutter in Macon headed to the Ocmulgee, a thunderstorm over Athens bound for the Oconee, a spring feeding the Ohoopee in Reidsville…the list goes on and on. This single mighty movement was, not too far upstream, a few thousand individual streams, collecting water from countless hollows, forest, fields, lawns, roads, parking lots and roof tops. Around us and ahead of us was the estuary that this collected flow feeds—a nursery for blue crabs and shrimp and other things we love to eat. But, as we learned, the nursery hasn’t been fairing so well. Crab harvests are down 60 percent since the 1970; the shrimp harvest is down 50 percent over the same time period. Much of the decline can be attributed to alterations to the upstream landscape—the loss of wetlands and the compromised river flows that come with those loses and other changes to our river systems. How is it that a filled wetland in Lumber City or Dublin or Athens can impact a blue crab’s home on the coast? Fill or destroy enough wetlands and these natural sponges cease doing their job properly. Left unmolested, they hold water during wet periods and slowly release it during dry periods, regulating the river’s flow into this estuary. For crabs and shrimp to thrive, the right mix of freshwater and saltwater is needed. Alter it slightly with too little freshwater and crabs succumb to saltwater-loving parasites. Crab and shrimp at the low country boil in Darien during our journey’s end celebration. Meddle with the land here, drain a wetland there, dam a stream elsewhere, and the system gets out of kilter. That’s the perspective from the mouth of a river where the cumulative health of thousands of streams determine the health of an estuary and a vast sea. Yes, it is difficult to fathom, but what happens on Beaverdam Creek in Macon, Line Creek in Athens or Town Creek in Hawkinsville has a profound impact at the mouth of the Altamaha. We each would do well to think of ourselves as a stream. Alone, we may seem insignificant but our cumulative actions make mighty movements. Odds and Ends—This year’s paddle was our biggest ever, involving 370 participants, including 350 that “thru-paddled” The event generated more than $25,000 for river protection, bringing Paddle Georgia’s eight-year river protection total to $150,000, not bad for a bunch of river rats. 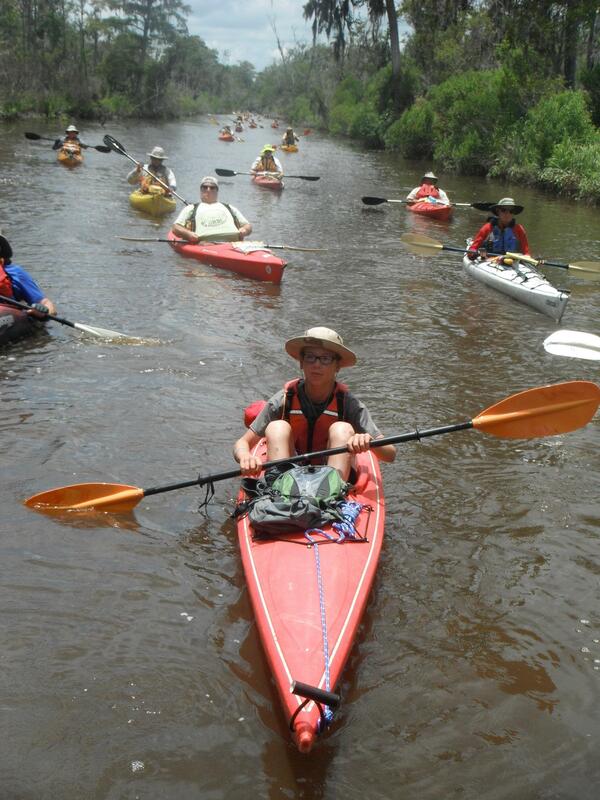 Paddle Georgia 2013—Next year’s event is set for June 15-21 on the Ogeechee River, one watershed north of the Altamaha along the Georgia coast. Scouting begins in late summer, and registration will open in February. A mammoth tupelo near Miller Lake…and one average-size girl! One thing you’ll never hear a Paddle Georgia participant say: “Duct tape won’t fix that.” Preparations for the final 13 miles of a 105 mile journey. Beating the heat and soaking in the Altamaha near Gamecock Reach.